Hyundai has delayed the opening of its new Russian factory by a year after new-car sales slumped in the country. The Korean carmaker's plant in St Petersburg will now start producing cars from 2011 rather than 2010. Its planned annual capacity is 100,000 units. "The situation in the market is dire, so we are taking things more slowly," a Hyundai spokesman said. "We have bloated inventories and we don't know how long the downturn is going to last," the spokesman added. Hyundai plans to build a small car designed specifically for the Russian market in St Petersburg. 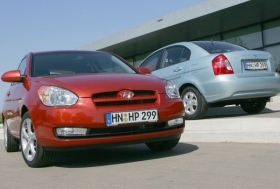 In December, Hyundai's Russian sales fell 45 percent to 9,706, according to the Association of European Businesses in Russia (AEB). With new-car sales last year of 192,719, Hyundai is Russia's second best-selling Russian brand after Chevrolet. Many analysts expect new-car sales in Russia to fall steeply in 2009 after a period of rapid growth as the economic crisis worsens. The AEB has forecast a 19 percent fall in foreign car sales in Russia during 2009, calling this an optimistic scenario. PricewaterhouseCoopers said sales in Russia could drop by 25 percent to 50 percent in 2009 as the global financial crisis squeezes demand. Investment bankers Goldman Sachs, expects sales to fall 20 percent this year to 2.4 million. Before the onset of the crisis, Russia was poised to become the largest car market in Europe in 2009, but a slowdown began in October 2008, when many banks were forced by the credit crunch to stop giving affordable car loans to Russian consumers.